Linda enjoys searching for fascinating travel destinations, seeking relaxation and fun, and (of course) eating great food. We stepped off the bus at Siena in mid-afternoon...and stepped into another world. There is no traffic in Siena. No cars. No horns blaring--just the pleasant sound of people laughing and talking and merchants bargaining with townsfolk and tourists. Surrounded by olive groves and the vineyards of Chianti, Siena is one of the most beautiful cities of Tuscany. 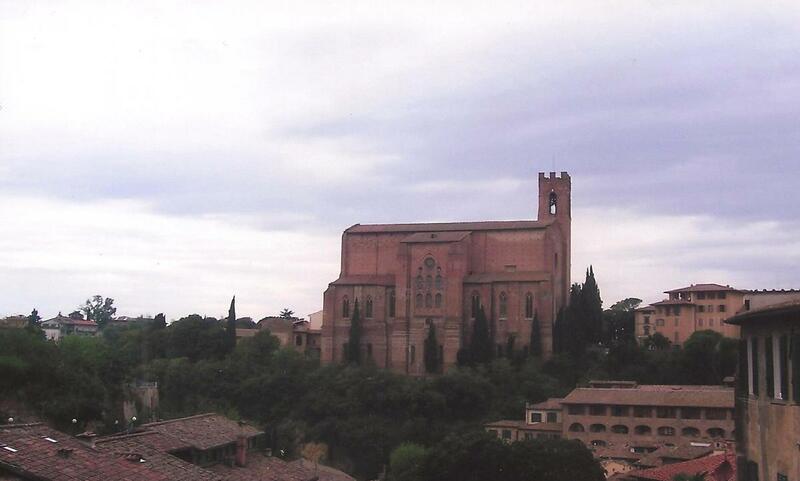 A visit to Siena is like journeying backwards in time. 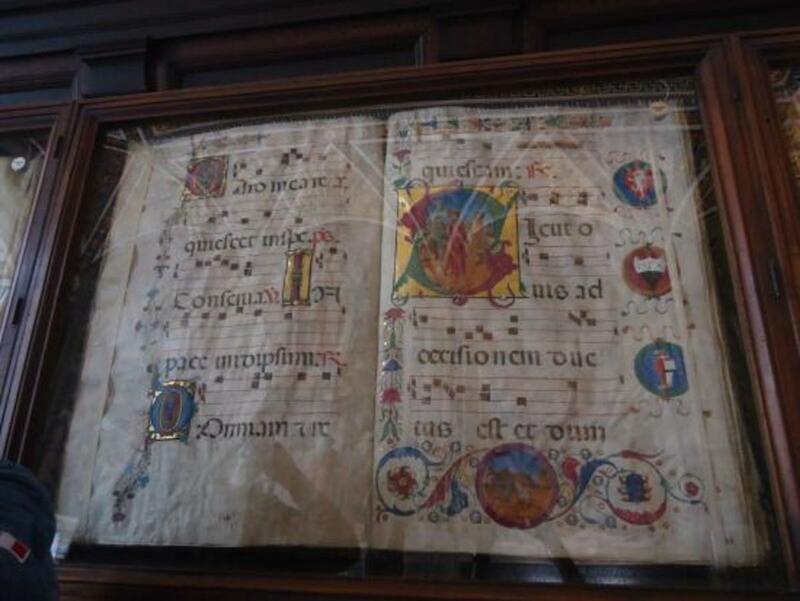 Everything seems to be much as it was in medieval times, when Siena enjoyed its greatest artistic splendor. Set on three hills, the city is drawn together by winding alleyways and steep steps to the Piazza del Campo— one of Europe's greatest medieval squares and a great place to begin our tour. 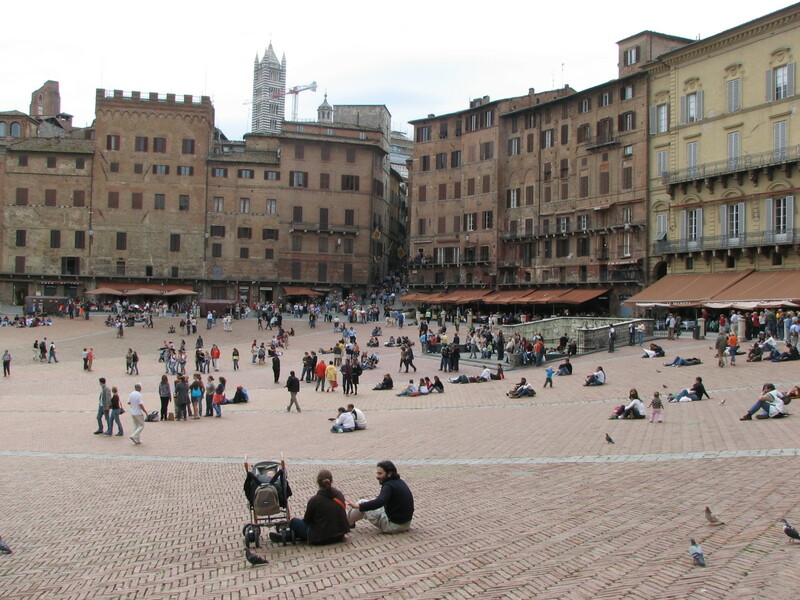 The Piazza del Campo is a broad fan-shaped courtyard. The fan was created to symbolize the cloak of the Madonna (shelter and protector of Siena), and is composed of nine segments; each segment representing a member of the Council of Nine (ruling body from 1287 to 1355). Sienna-colored brick buildings from centuries past surround Il Campo (as it is called by the locals). It is here that the Palio occurs twice each summer. A tradition since medieval times, this popular horse race is preceded by a historic cortege and costumed procession. Though the race itself lasts little more than a minute, the festivities which surround the event create a memory which will last a lifetime.. This imposing tower, built entirely of brick, was designed by Perugia-born architects Muccio and DiRinaldo. The tower foundation was laid in 1325, but actual construction did not begin until 1338; it was completed ten years later. The tower stands 88 meters in height, exactly the same height as the Siena Cathedral, not by coincidence but to signify the equal power of church and state. 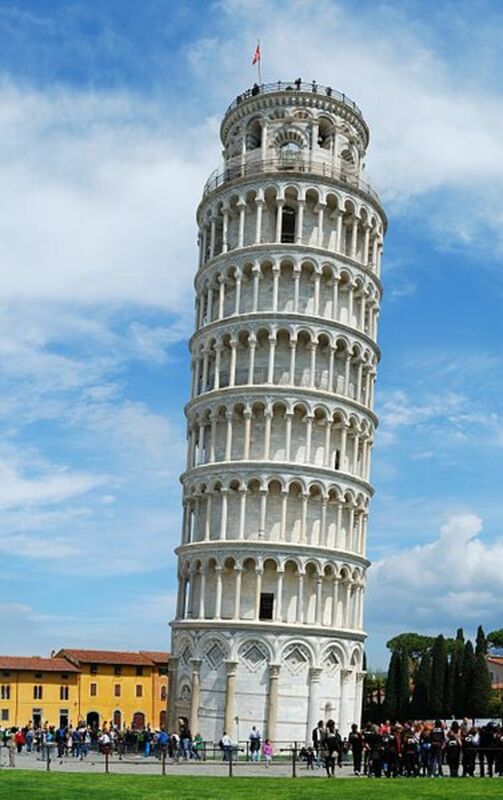 The literal meaning of “Mangia” is “Tower of the Eater.” So, how was the tower given such an unusual name? The first bellringer was a man named Giovanni di Balduccio, who had a tendency to spend all of his money on food from the taverns in Siena. Because of these excesses, he was nicknamed ‘mangiaguadagni’, which translates as someone who eats their earnings! 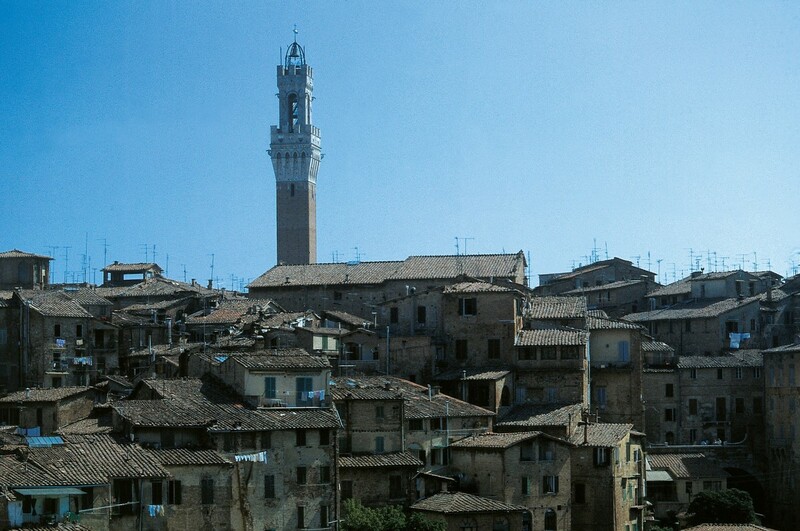 The tower is open to the public; with exactly 400 steps up you see the whole of the city of Siena and the stunning surrounding countryside as well. 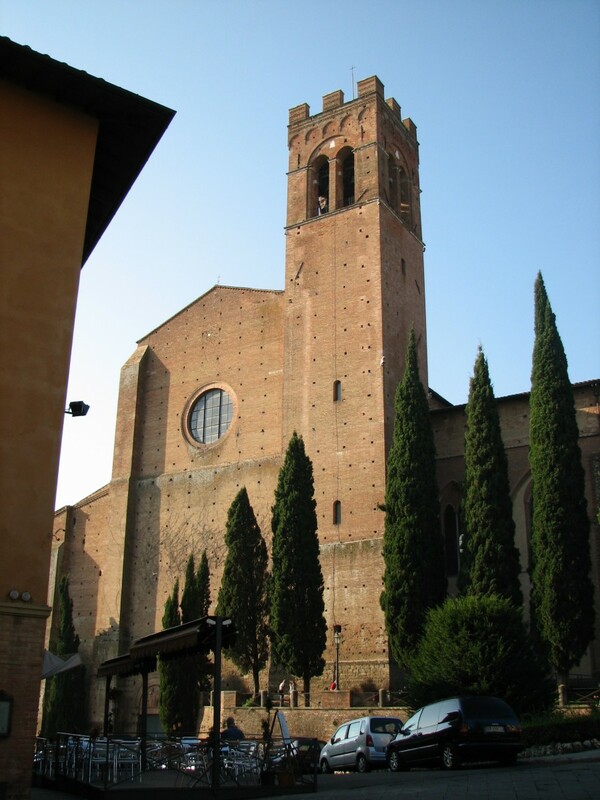 This strikingly beautiful church, dedicated to Santa Maria Assunta (Holy Mary, Our Lady of the Assumption) sits on the top-most point of Siena and is visible for miles. 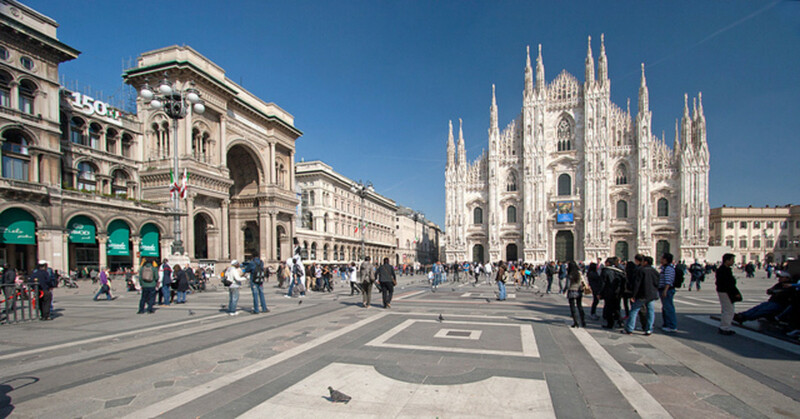 It is believed that construction began in the 9th century. The current structure dates from 1215 and was completed in 1263. 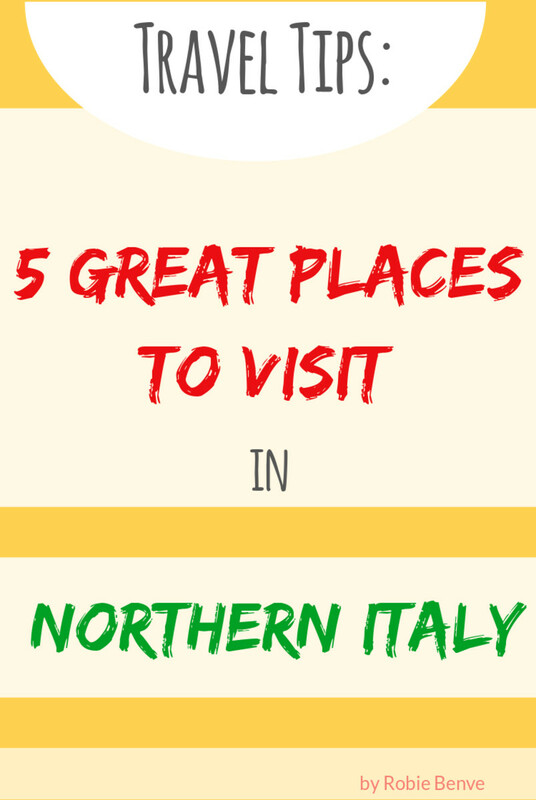 It is filled with sculptures by Bernini and Michelangelo, and so much more! The stained glass, frescoes, and inlaid marble floors depicting both secular and Biblical scenes present an almost overwhelming collection of artistic marvels. 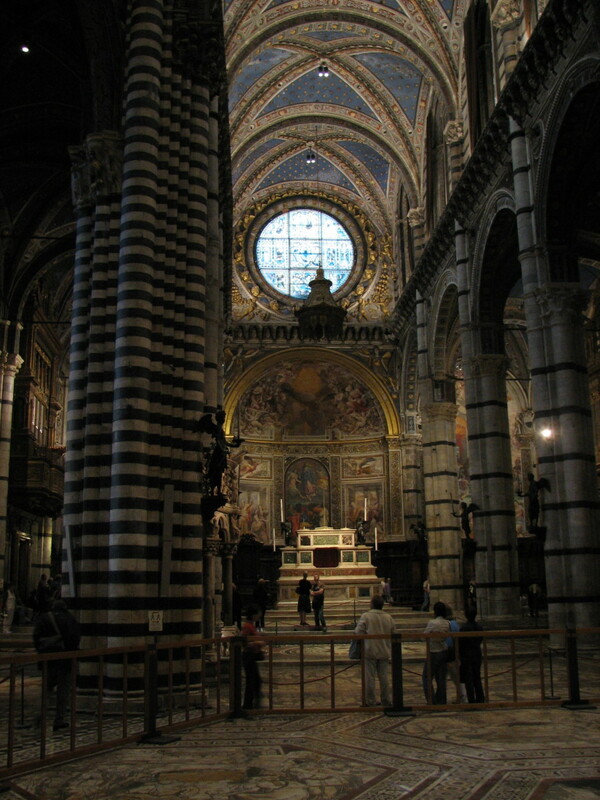 The exterior and interior of the building are constructed of white and greenish-black marble (the symbolic colors of Siena) in alternating stripes. There is a charge for admission; 10 euros might seem like a lot, but this pass gets you into the cathedral as well as the baptistery, crypt and Opera museum and is valid for 3 days—well worth the cost. When you visit, please don’t forget to look down. 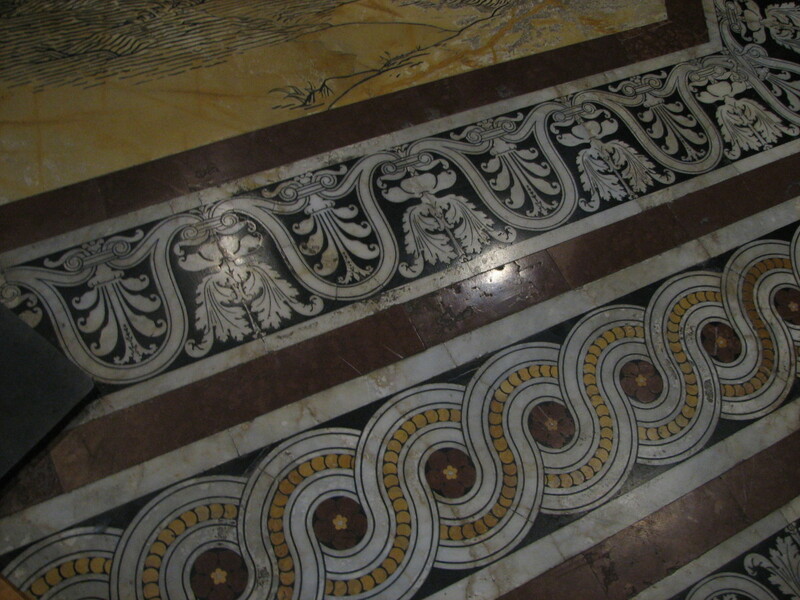 The most impressive and beautiful of the treasures of the cathedral are on the floor which is decorated with mosaics and etched marble. 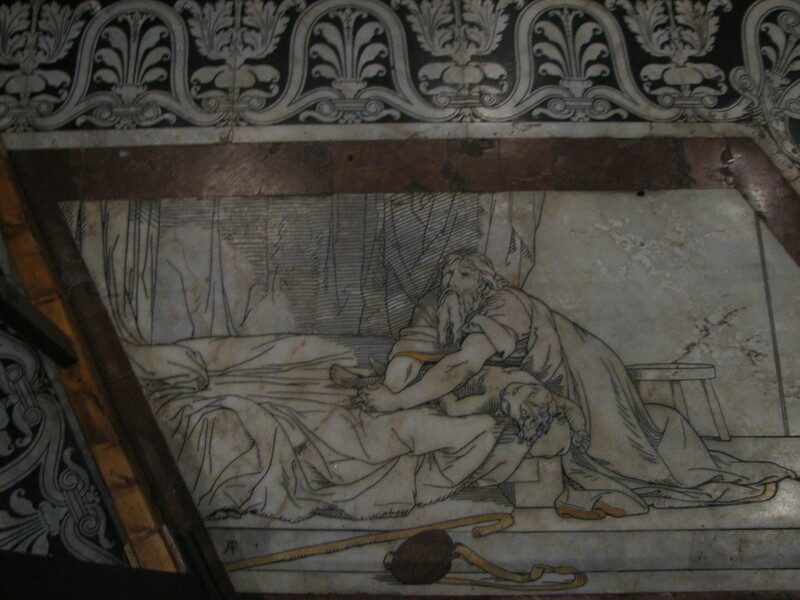 The 56 etched and inlaid marble panels were designed by 40 leading artists between 1369 and 1547, all but one from Siena. 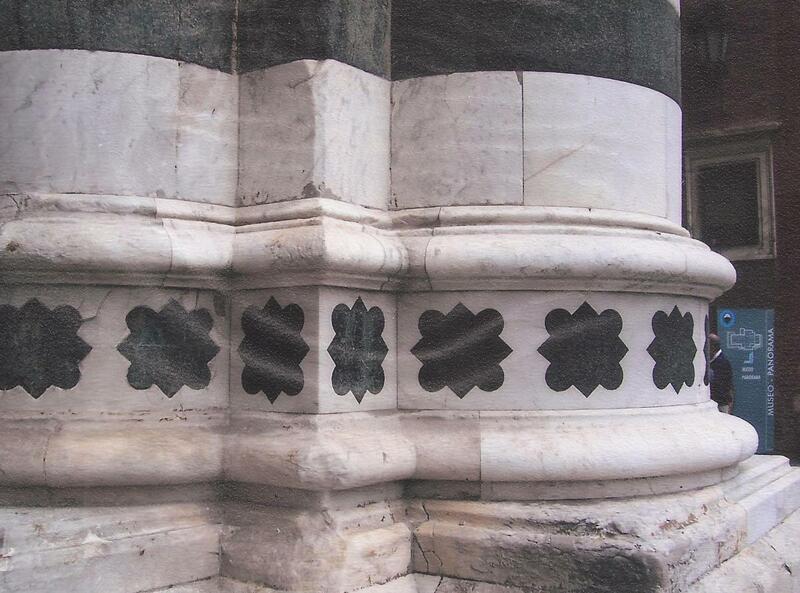 Completion of the designs took six centuries, the last ones finished in the 1800s. Today, the mosaic panels in the nave and aisles are usually uncovered although protected from passing feet by barriers. Enea Silvio Piccolomini—not a household name today, but certainly a powerful man in the 15th century. Not only did he serve as the mediator during talks to reconcile the Papal State with Emperor Frederick III, it was also he who arranged the emperor’s marriage with Eleonora of Aragon and his subsequent coronation in Rome. As a reward, Piccolomini was appointed as the Bishop of Trieste in 1447; three years later he was reappointed as the Bishop of Siena. Eventually, in 1456, he became a cardinal. In 1458, he was elected pope and took on the name Pius II. Siena’s most famous museum is situated in the heart of the city, on the first floor of the city hall (Palazzo Pubblico) in the Piazza del Campo. 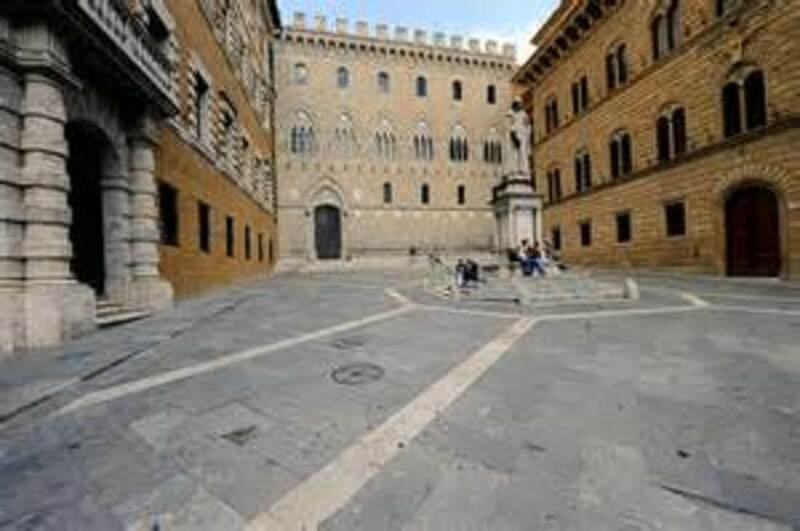 As you enter the building you will find the municipal offices on the right (yes, the administrative functions of Siena are still housed in this building); to your left you will find the courtyard (Cortile del Podestà). 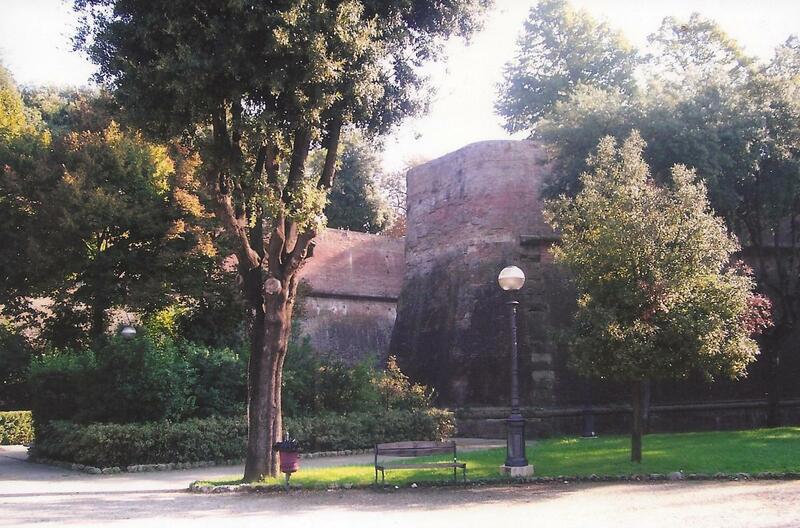 From there you can enter the museum or access the Torre del Mangia. The Sala dei Nove, the Hall of the Nine, houses the main attraction of the museum, the fresco of Good and Bad Government by Ambrogio Lorenzetti. The paintings that cover three walls of the room are exceptional in the art history of the time, representing secular subjects instead of religious ones. The Government of the Nine (Council of Nine) wanted to demonstrate with the allegory of the figure of Justice how the city and the surrounding countryside work under the right governance (good governance) and how it could be if it was the opposite (bad governance). Unfortunately, the wall with the Bad Government is badly damaged and only a portion is still visible. This barn-like Gothic church is San Domenico. Construction began in 1227, and the bell tower was added 130 years later. Inside is a chapel dedicated to St. Catherine, the patron saint of Siena. It was bult in 1460 to store her preserved head which is kept in a gilded marble tabernacle on the alter. (No, we did not add this tourist-attraction to our list of must-see's). I mention San Domenico beause it was just a stones throw away from the Alma Domus, a quasi-hotel (not a convent) run by non-English speaking sisters of the S.D. The rooms were spartan, clean, and very inexpensive. We each had a balcony and an absolutely breath-taking view of the Duomo. 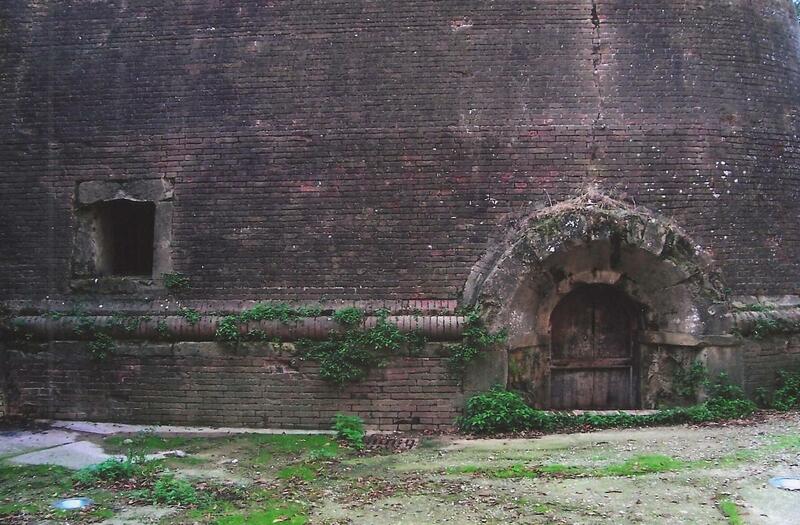 If you visit the San Domenico, you will see just steps away an aged brick wall. Time worn, weary, ancient. Who built it and when? I have no idea. Is it Roman? Perhaps, but I think not. Siena did not prosper under Roman rule. It was not located near any major roads. 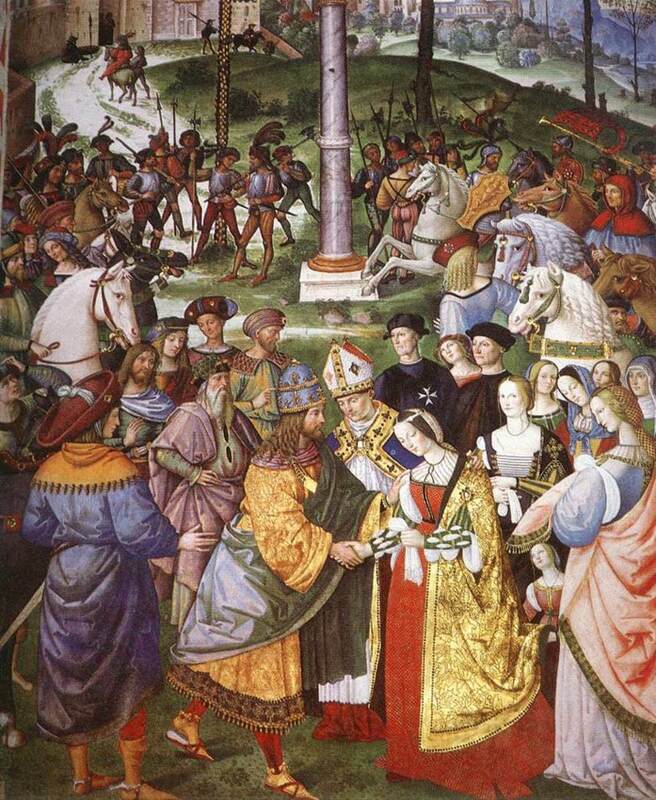 It was not until the Lombards invaded that Siena began to prosper. 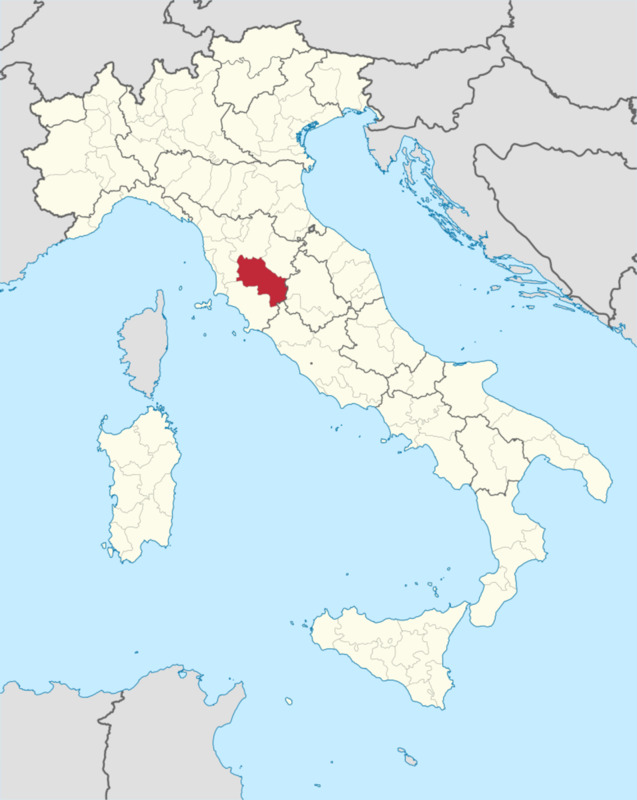 The Lombards rerouted much of their trade through Siena which then became a significant trading post. Built in the 14th century, this Gothic-style structure is home to the Monte dei Paschi di Siena Bank--the oldest surviving bank in the world (it was established in 1472) and is Italy's third largest bank. As Carb Diva I would be remiss if I did not take a moment or two to talk about the food of Siena. After spending a long day exploring this beautiful city, wandering the streets, taking in all of the amazing art and architecture, one needs to sit down and enjoy a relaxing, nourishing meal. The food of Siena is certainly that, and so much more. Sienese cuisine is pure and simple, based on fresh, local ingredients combined with care and tradition. Soups are an important part of the Sienese/Tuscan meal. My family and I enjoyed a splendid meal at the Ristorante Nello La Taverna, and our favorite part of the dinner was the ribollita soup. I have done my best to recreate that savory, succulent dish. 1. First sort and wash the navy beans. What do I mean by sorting? Spread them out on a cookie sheet and pick through them looking for rocks, small clumps of dirt, or shriveled beans. Trust me, you don't want to have those things in your soup. Beans are not washed when they are harvested--any moisture would cause them to mold, so please wash your beans to remove field dust. 2. Next, place your washed beans in an 8-quart stockpot. Add enough water to have about 2 inches of water above the beans (about 6 cups of water). Bring to a boil over medium-high heat. Boil 2 minutes and then remove from the heat. Cover and let stand 1 hour. This soaking time will reduce the actually time the beans need to simmer and will help retain nutrients. 3. In the same stock pot, sauté the onion, celery, and carrots in 1/3 cup olive oil until softened—about 5 minutes. Add the chopped tomato and sauté a few minutes more. 4. Add the soaked drained beans and 2 quarts of fresh water. Bring to a boil over medium-high heat. Reduce heat to low; cover and simmer about 2 hours or until beans are tender. 5. Once cooked, pour the beans into a large mixing bowl. Remove one-half of the beans and broth to a food processor and blend until smooth. Wash the stock pot and return it to the stove. Heat to medium. 6. Add the garlic, thyme, and remaining 2 teaspoons olive oil to the stock pot; simmer a few minutes. Stir in the kale and continue to cook a few minutes more, until the kale begins to wilt. 7. Stir in the blended beans and broth. Bring all to a simmer over low heat. Simmer for 30 minutes. 8. 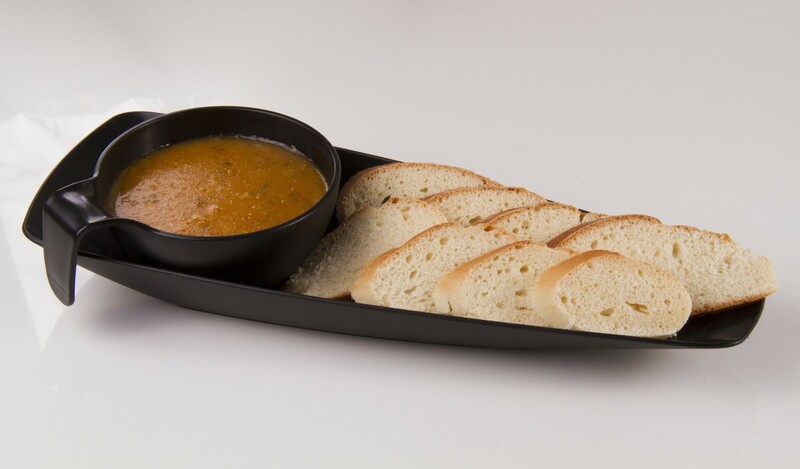 Stir the bread into the soup. Continue cooking for another 30 minutes, mixing occasionally. This is a good time to check the salt and pepper too. 9. Add the rest of the beans and broth and a pinch of red hot pepper. Mix in well. 10. Serve warm with a bit of olive oil. *NOTE: If your bread is not dry you can slice it and bake it in the oven at low heat to dry it quickly. When one speaks of Sienese/Tuscan food, the wine of the region has to be a part of the equation. There is a saying, “un prazo senza vino e come un Giorno senza sole.” A loose translation is “a lunch without wine is like a day without sunshine.” Of course, Chianti is the go-to wine for this region. Created by the Italian minister Ricasoli, it was the first Italian wine exported to America. Seven hundred years ago Siena was a major military power in a class with Florence, Venice, and Genoa. With a population of 60,000, it was even bigger than Paris. 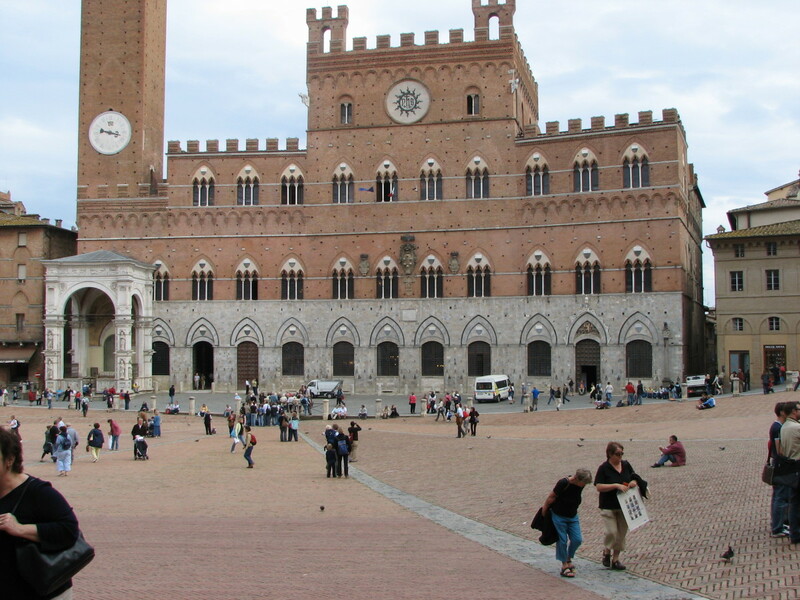 In the 14th century, a plague weakened Siena. 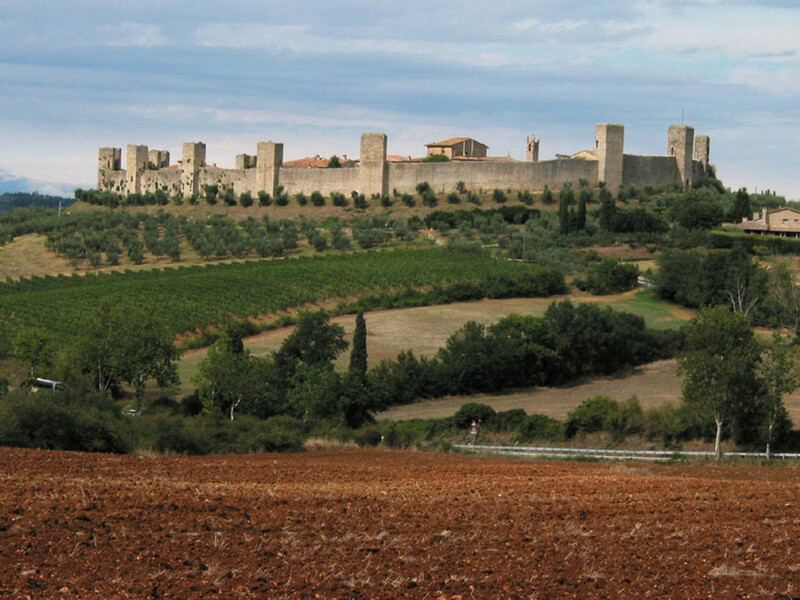 Then, in the 1550s her bitter rival, Florence, savagely assaulted her, forever reducing Siena to a non-threatening backwater. 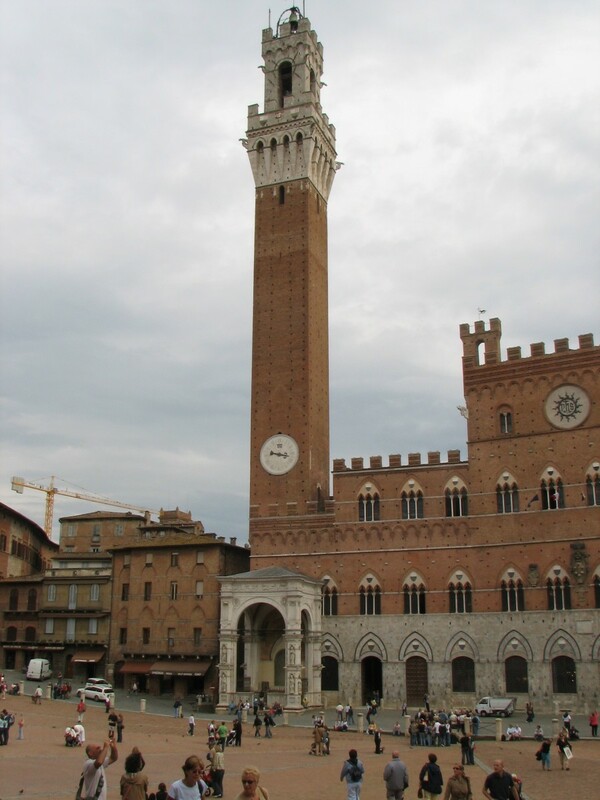 Today the population of Siena is still 60,000--and the population of Florence is 420,000. In my opinion, Siena's loss became our gain. Flourish - We would have SOOO much fun. But, honestly this trip was 9 years ago. I've slowed down a bit. OMG, I wish I could travel with you. Simply perfect. Bill DeG - Pizza and beer is a good choice--I'll have a gelato if you don't mind. You sir are amazing when it comes to writing about travel--praise from you on this topic means a great deal to me. Thanks for your kind words and for stopping by. Great job Carb Diva. Siena is one of my favorite Tuscan towns. Love just sitting with a pizza and a beer in the Piazza del Campo. You are right about the sounds of Siena, nothing but laughter and joy. Well done. Rachel - I am glad that you enjoyed the tour of Siena. It was truly a magical trip. Blessings to you as well. Oh Bill, I'm sorry. Even if you can't actually travel to Siena, try the bread soup recipe. It would be perfect for this blustery weekend. Sheez, you act like this is a possibility for me, Linda. LOL Who would take care of my critters? More importantly, where in the world would the money come from? :) Great travel article...really....have a wonderful weekend. Oh, that is just how I picture Italy to be. I know it's not like that all over, but that spot and all your pictures are just splendid. 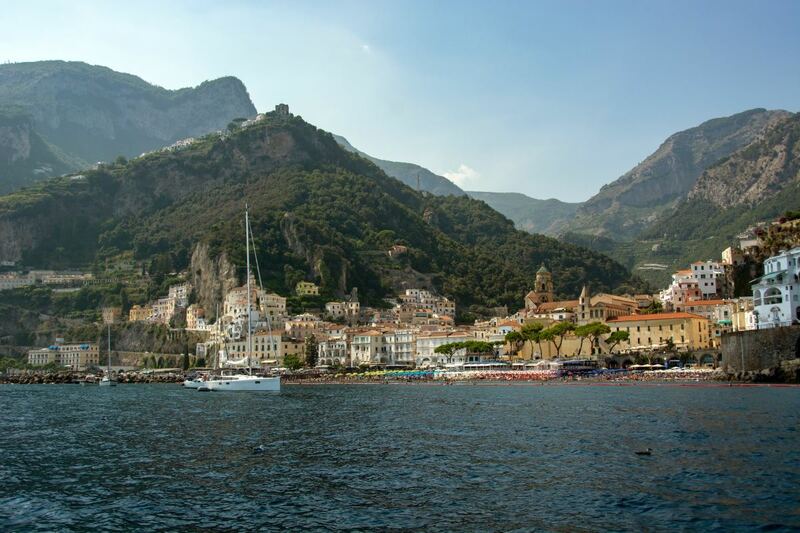 I will have to see Italy vicariously through your visits and pictures. Thank you for sharing your vacation with us.